The Hungry Photographer: Challah, Take One. Bread baking puts me in the position of facing the prospect of a serious failure, and we all know how little I like the thought of turning out failed baked goods. I've never made a sponge starter. Making one successfully, so I'm told, is a difficult task and often a massive flop on your first few tries. Facing the fact that I will very likely fail at this task but talking myself into attempting the recipe anyway. After seriously battling every instinct I had to find something (anything!) else to do to avoid attempting making challah, I have taken the leap and decided to dive on in. Here's how my morning's going so far.... Not too well. I mixed together my sponge to discover that it was runny and not at all like "a very smooth, very thick batter" as the book describes. After triple checking my measurements, I noticed the date on my recently EXPIRED yeast... blargh! Thinking maybe that could have had something to do with my soupy starter (but doubting it nonetheless), I ran off to the grocery store to purchase some UN-expired yeast. With fresh yeast in hand, I attempted starter numero dose. As I suspected, the yeast had nothing to do with the texture, and once again, I ended up with a very smooth, very thin batter. At this point frustration was seriously setting in. Not sure what I was doing wrong, I ran to the all powerful internet to see if I could come up with some kind of explanation. I found a few fixes for sourdough starters, but this is a sponge and as far as I can tell, a whole other beast. Feeling impatient and on the brink of giving up, yet determined not to fail, I decided to start adding flour to my third starter, trying to emulate what I believed to be the right consistency. 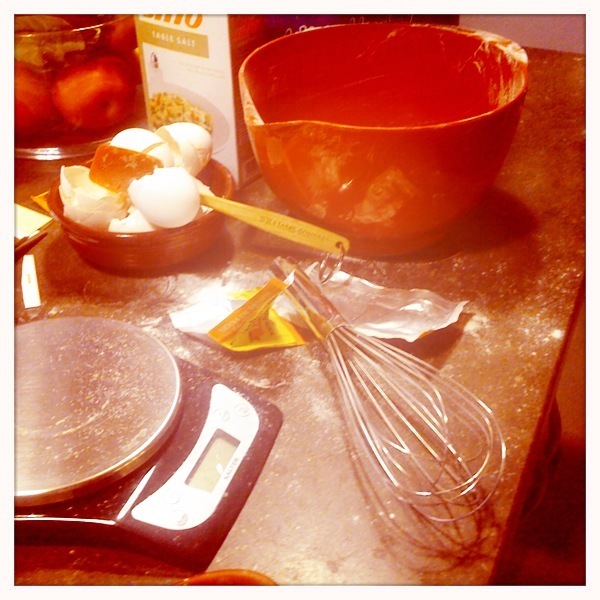 Now, those of you that know me, know that I am a stickler for 'the rules' when it comes to baking. Just randomly throwing flour into a recipe is completely against my character and frankly a little stressful. At this point, I am still fighting the lump in my throat that is pushing me to bail on this project. If I bail now, I'll never have to know that my bread was a complete failure. BUT on the flip side, if I bail now I'll also never know if the bread may have turned out to be a success either. P.S. If anyone out there has any sage advice, I'd LOVE to hear it!